I love Hacienda Azucena. Ever since I did Lauren & Tyler’s intimate hacienda wedding back in 2015, I’ve always wanted to go back. 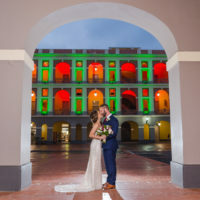 I was lucky with Cynthia & Richard, not only were they planning a beautiful and fun destination wedding there, but they were SO sweet and beautiful…! Minutes away from El Yunque Rainforest, Hacienda Azucena is the perfect venue for smaller weddings. It has lush decor, beautiful flora, and a fantastic view of the northern coast of Puerto Rico. I arrived early at the venue, to take a few portraits of Cynthia getting ready. She was accompanied by her bridesmaids and her mom, which were super helpful and excited about being there for her. After a lot of candid pictures and Cynthia’s bridal shots, I went downstairs to meet Richard, who was walking around the property with his groomsmen, who were helping him set up the final details for the wedding day. We did a few portraits until it was about time to start the ceremony. It was beautiful and emotive, full of laughter and emotional moments. I was just so happy to be there! We did the family portraits right after, and then a beautiful, golden sunset joined us for Cynthia & Richard’s newlywed pictures. They were just so happy and sweet to each other, that I just swapped to a long lens, walked back, and let them enjoy each other without any direction. The sun went down, revealing hundreds of twinkling lights that set the perfect mood for the party that was about to start in the terrace. The simple but delicate decor was infused with touches of a fitting wanderlust theme, as the bride & groom enjoy traveling together. Guests enjoyed the day from beginning to end and were highly cooperative when asked to do a group shot of everyone together. Pure bliss. Thanks, Cyn & Ritchie for trusting me with such special and happy memories. Hope you enjoy scrolling through this set of Cyn & Ritchie’s wedding. 'outdoorsy' wedding stories for the past 8 years. Contact Cami here.